A PFC-supported experiment conducted at the Joint Quantum Institute examines the role of disorder in maintaining quantum coherence. It does this by introducing disorder into a Bose-Einstein condensate of rubidium atoms held in an optical lattice to simulate the role is impurity disorder in high temperature superconductors. 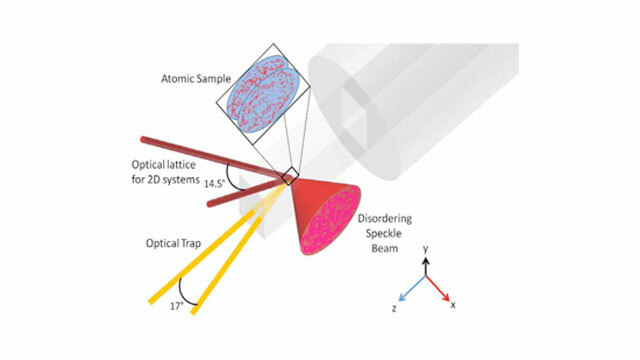 In the JQI condensate, disorder consists of “speckle” delivered by laser light sent through a diffuser; the slight disorder supplied by the speckle laser ensures that the atoms retain their coordinated participation in the unified (BEC) quantum wave structure. But only up to a point. If too much speckle is added then the quantum coherence can go away. The JQI scientists make this visible. They pry their disk-shaped gas of atoms into two parallel sheets. If the atoms were in a coherent condition, their collision of the sheets (when the lasers are turned off) will result in a crisp interference pattern showing up on a video screen as a series of high-contrast dark and light stripes. If, however, the imposed disorder had been too high, resulting in a loss of coherence among the atoms, then the interference pattern will be washed out. Such patterns are observed. The resultant paper reports the first direct observation of disorder causing this kind of fluctuation between phases.